Throughout the years, my aunt talked to me about little stories of prayer and healing that could only be explained as miracles from God. I was able to convince her to record her thoughts so that others could learn about the amazing things that have happened during her life. The fact that God allows ordinary people to see phenomenal miracles is something that should be shared, not only in our families, but also with everyone we encounter. 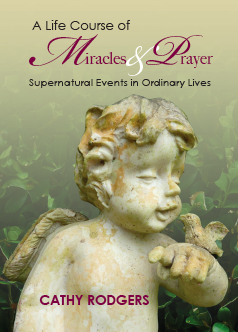 Join me as I share stories of miracles: split second interventions from near fatal car crashes, gallstone pain, migraines, a heart attack, and permanent paralysis. Read the words of hope spoken at just the right time, along with visions from heaven. These are the ways God chooses to work in ordinary lives. Cathy Rodgers lives on a tidal creek in Savannah, Georgia where she experiences the daily ebb and flow of life on the saltwater marsh. She enjoys writing, photography, gardening and creating websites and blogs in her company called Seven Waves Marketing. She is passionate about her faith and helping others with their health and weight loss challenges through a blog called Cathy Chats. She refers to herself as, “Just a praying grandmother passing these miracles on to the next generation.” “One generation will praise your deeds to another…” Psalm 145:4. I’m so glad to see Cathy here. I hope to be her one day soon! Thank you both for allowing God to use your gifts for Him. Yes! I’m happy for Cathy and you too! Oops! I meant “I hope to be here one day soon.” Of course, it sounds like Cathy has a pretty great life, so it may be fun to be “her,” too. Lol.